Brand new, out of the box, and LED does not flash. Too much trouble to send back to Amazon.com. Looks just like the real thing. Blinking light is a plus. THIS IS AN EXCELLENT PRODUCT WHEN IT COMES TO FOOLING PEOPLE. I USED THIS IMITATION CAMERA ON MY BUSINESS AND NO CRIME EVER SINCE. ITS REALISTIC APPERANCE REALLY LOOKS LIKE THE REAL THING! IT ALSO HAS A RED LED LIGHT THAT FLASHES TO ADD TO THE EFFECT. VERY EASY TO INSTALL! LESS THAN 5 MIN FOR ME. JUST SIMPLY TAKE THE PRODUCT OUT OF THE PACKAGE INSTALL THE AA BATTERIES AND THEN SIMPLY MOUNT. I LIKED THE PRODUCT SOO MUCH THAT I BOUGHT MULTIPLE. IT NOW LOOKS LIKE I HAVE A FULLY OPERATING SECURITY CAMERA SYSTEM AT MY BUSINESS. WOULD HIGHLY RECCOMEND!!! First let me say that I have a background in law enforcement that includes burglary investigations. So I would like to state the, "why", of purchasing a camera. Burglars typically "case", a neighborhood, looking for an soft target before choosing which home to enter. They are looking for any sign of absent tenants, burglar alarms, dogs, or worst case - cameras. We have all seen burglars, robbers, and other criminals caught in the act of being bad. The apprehension rate is high and conviction rate even higher. I don't know about you, but I would much rather a burglar or home invasion criminal judge my house as too high the risk and just move on to another home that has no apparent protection. With the current economic recession where I live in San Diego we have have seen a significant increase in burglaries and thefts in our upscale neighborhood. These,"cameras", are very realistic looking. 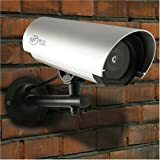 In fact this is the housing for a genuine security camera sold by the same company. I can't tell the difference. And installation was a piece of cake. All I needed was a screwdriver. Everything else I needed was included in the box, including the 3 screws. BOTTOM LINE: Looks like the eyes of an expensive security system (over $1,000) for $30.